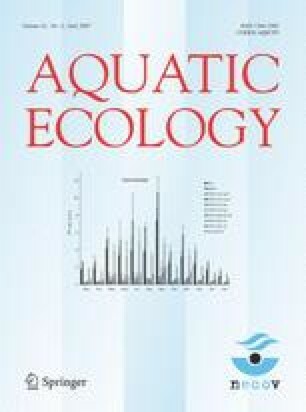 The littoral nematode community adjacent to a river mouth (River Schussen) on Lake Constance (Germany) was studied from February 1999 to January 2000 in order to determine the influence of stress resulting from fluctuations in river discharge on local nematode assemblages. Additionally, the influence of wind as a second important stress factor was considered. Six sample sites were chosen, reflecting a gradient of river influence within the broader river mouth area. Nematode communities, varying in a mean range from 121 to 165 ind/10 cm2, were found to differ significantly in terms of abundance, feeding type composition and species diversity. Deposit feeders were most abundant at all sites followed by chewers. Deposit feeders were affected mainly by wind events, while species diversity and the occurrence of chewers were influenced mainly by river discharge. The impact of both these stress factors was modified by a third variable, water level. Moderate and high levels of combined habitat stress led to significant changes in community structure. Under conditions of calm weather and low discharge, reduced species diversity and an increased predominance of deposit feeders were observed. In most cases, species diversity was found to be higher under moderate stress conditions, an observation that offers support for Connel’s Intermediate Disturbance Hypothesis. We thank Simone Eckenfels and Petra Heim for help with microbial analyses and sample processing, Susanne Fitz and Viola Burkhard-Gehbauer for help with water chemistry analyses, Barbara Haibel for determining phytobenthos, Nicola Reiff for preparing nematodes, and Alexander Brinker for statistical advice. The manuscript has benefited from the comments of Alexander Brinker, Hans Güde, and Tom Moens. This research is part of a dissertation to be submitted to the University of Constance by A. Witthöft-Mühlmann, funded by the German Research Foundation (Special Collaborative Research Programme 454 “Littoral of Lake Constance”).